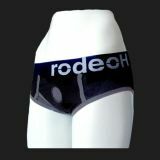 Like any pair of underwear, it will not last forever, but you can increase their longevity by treating them with care. Machine or hand wash and hang to dry. Do not boil. Do not eat. Wear as underwear, or with another pair beneath them. Find whats most comfortable for you. We have found optimal toy dimensions to be 5"-6" length by 1 1/2"-2" width. Have fun. Be safe. Only in size 3XS !